Spend your birthday party free wheeling down the lowers slopes of Table Mountain and Signal Hill in Cape Town! Kids will have fun in an active way under the helping hand of our professional guides! The Monster Scooters® are non motorised and easy to manoeuvre! You simply control your speed by applying the breaks which are similar to mountain bike disc breaks. Before we start all the participants are issued with helmets and cycling gloves. Then they get instructed on how to ride the Scooters before we depart on the free wheel runs. We descend the hills in a controlled manner under the guiding hands of our friendly staff. Transport to the top of each run is included in the package. After the two downhill runs we end up in a lovely park with picnic facilities where you will then have the opportunity to hang out with your friends and enjoy your own refreshments! Here we will also show you pictures of the adventure you just completed. 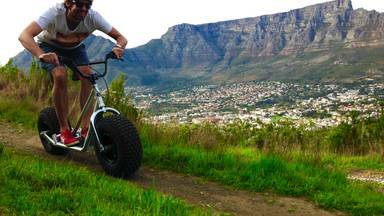 A Unique way to Experience Cape Town’s Table Mountain. This 5 km track will take you on an adventurous off road track down the side of Signall Hill into Bo Kaap. The Experience continues as you are transported to Table Mountain for you final run down a single track off this world famous land mark! We start at Table Mountain’s Lower Parking Area just off Kloof Nek Road. This is at the Table Mountain Info Office and there is plenty of safe parking. After guests are kitted out with their helmets and gloves they get transported to the top of Signal Hill for their 1st Downhill Run. The trip is not only fun but also informative as the guides will keep you entertained with info about the area aswell! We get picked up in Bo Kaap by the driver and then we head for the main run down Table Mountain from Dead Man’s tree all the way down to Deer Park where the driver will pick us up again and bring us back to the starting point at Lower Table Mountain. Scooters are non motorised making this eco friendly. These Swiss designed scooters are used in the Alps during the summer season on the ski slopes when the snow is gone. All trips are guided by professional qualified guides. 2 Runs – 1 x Down Signal Hill and 1 x Down Table Mountain’s side.